On the Home Front reports on Riverton’s role during WWI. Mailed copies had two errors – one in the IN THIS ISSUE table on the front page and Edith Holvick’s name was misspelled. This version is correct. Inside this issue learn about Riverton’s Gold Star Boys of World War I. President Phyllis Rodgers’ President’s Message outlines what’s ahead. The Daniel Campbell Preservation Awards Night will be at 7pm on Thursday, February 16 at the Porch Club; Kate Butler’s The Golden age of Silent Film is on for March 23. Your HSR Editor plays Show and Tell with some past items from rivertonhistory.com on page 4. Pat Solin authored the feature article, “Riverton’s Gold Star Boys of Word War I.” It is the first of a series of three pieces honoring the valor and sacrifice of those who served in the Great War as well as describing the way on was here on the home front. Two more essays, “On the Home Front” and “A Grateful Community, will follow in successive issues. Here is a list of people from Riverton, Palmyra, and Cinnaminson who served during World War I as it appeared in the July 4, 1919 issue of The New Era, a hometown newspaper of bygone days. You just might see a name you recognize. The Society would be honored to help preserve your information, documents, photos, and artifacts related to the roles played by Rivertonians during the Great War by displaying them here. Please contact us or phone 856-764-1551 and leave a message. Open the PDF, pause your mouse over blue highlighted underlined text, and click on the links to reveal extra content. We thank Mrs. Pat Solin for contributing this timely article on aspects of World War I history seen from a local perspective that one does not find in history books. Rev. 1/27/17: The mailed newsletter had an error in the first paragraph on page 1: Armistice Day occurred in 1918, not 1919. These files for downloading are fixed. Thanks to Paul Schopp for the correction. Rev. 2/13/2017: Page 3 of this newsletter lists the wrong dates for two June cycling events. The Historic Riverton Century and Community Ride runs on June 10 and the Historic Riverton Criterium June 11. Inside this issue learn how Locals participated in suffrage battles. Read a recap of the Oct. 27 Witchy Woman presentation. See what is in store during the Candlelight House Tour as the our Museum-for-a-Day returns to the Library Dec. 13. We honor veterans on Nov. 6 as four names are added to the War Memorial and will publish articles in 2017 to mark the centennial commemoration of the US entry into The Great War. A 2017 Dues Form is included with this issue. Find inside the 4th and last installment of Paul Schopp’s Digging for Some History. Editor John McCormick invites you to see the refreshed website at rivertonhistory.com. 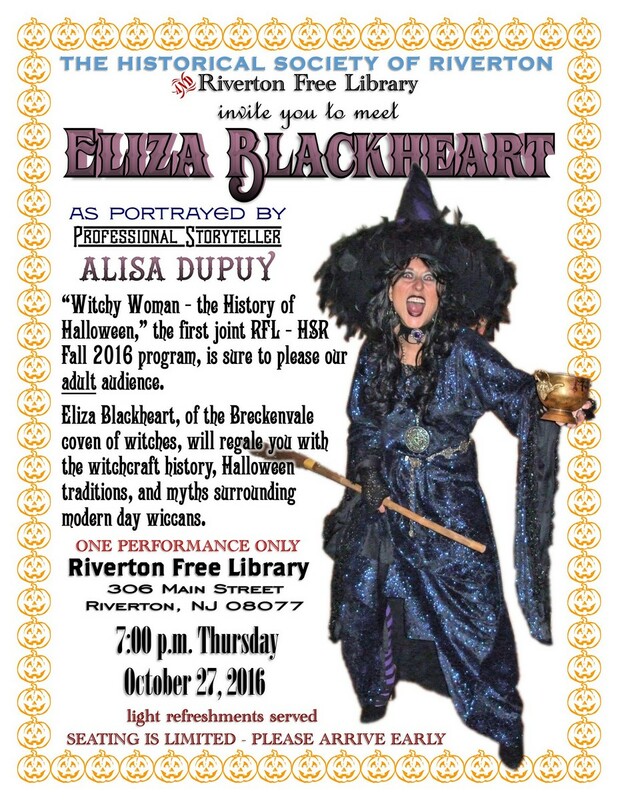 CORRECTION: Alisa Dupuy’s Witchy Woman presentation will be on Oct. 27, not Oct. 31 as published in the newsletter. See two program announcements and read our thank-you notes. This somewhat delayed Gaslight News arrives in the nick of time to share with your visiting friends and family over the Holidays. Get a review of our trip to Kenneth Frank’s Japanese beetle lecture at the Academy of Natural Science. Read the recap of Maggie Worsdale’s Nov. 17 performance as Martha Washington. Get a preview of Maggies Worsdale’s Nov. 17 performance as Martha Washington. See what’s been going on at rivertonhistory.com.